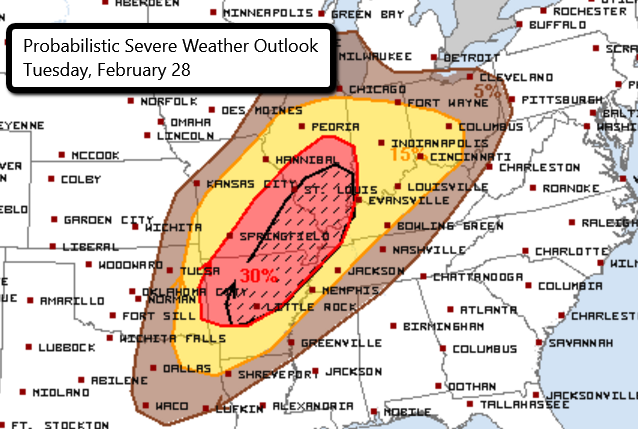 The SPC has now highlighted an area where there is a significant probability that severe weather could occur tomorrow. This area stretches from northern Arkansas through southeast Missouri and into southern Illinois. Major cities include Little Rock, Jonesboro, and Conway in Arkansas as well as Belleville, IL. Severe weather will be possible across a good chunk of the eastern U.S. through the middle of this week. 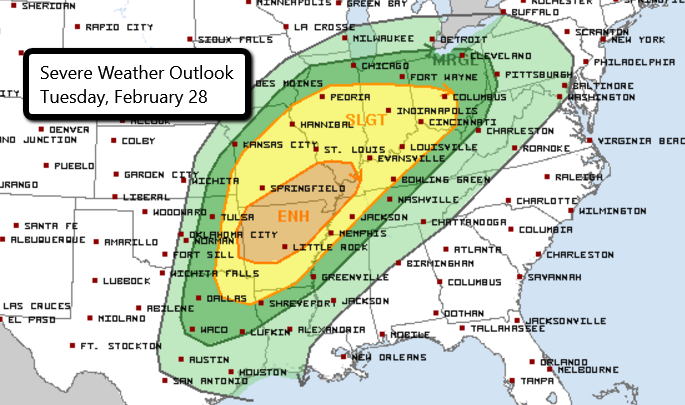 There is an Enhanced Risk of severe storms Tuesday and Tuesday night for parts of southern Missouri, northern Arkansas, extreme southern Illinois, and western Kentucky. Any storms that develop in these areas could produce damaging wind gusts, large hail, and even a tornado or two. At this time, a strong tornado cannot be ruled out. 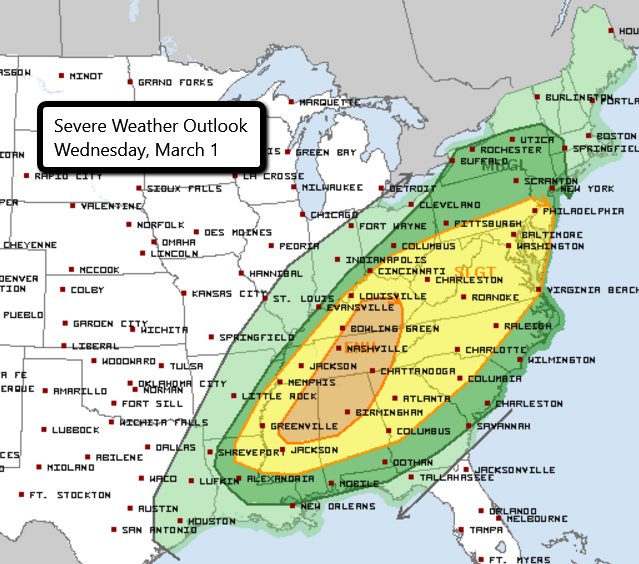 This severe threat will spread eastward Wednesday with an Enhanced Risk of severe weather stretching from east central Kentucky through eastern Tennessee into parts of northeastern Mississippi, north Alabama, and northwest Georgia. This includes Nashville and Chattanooga, TN as well as Huntsville and Birmingham, AL. Much of the Southeast, Tennessee Valley and Mid Atlantic is under a Slight Risk of severe weather. Any storms that develop on Wednesday will once again be capable of producing strong winds and large hail and even a tornado or two. As storms continue to push towards the east after sunset and into the overnight hours, a threat for damaging winds will persist. As we head into a rather active couple days of weather for the eastern half of the United States, it’s important to remember to have multiple ways to receive severe weather alerts, especially while you are sleeping! For the latest, check us out on Twitter! Follow the weather LIVE by watching our chaser feeds here.